Around 70 percent of business legislation comes from the EU. For that reason it’s EK’s core task to ensure that companies’ voice is heard and interests are defended in the decision making of the European Union. In order to do this, we monitor and influence all relevant regulatory projects with impact on the business environment. EK maintains daily contacts with EU institutions (European Commission, European Parliament, Council of the European Union). Furthermore, we take part in the social dialogue and, where European labour market organisations are involved, in the dialogue on working life issues. We are also represented in the European Economic and Social Committee (EESC). EK is committed to follow the Code of Conduct of the Transparency Register when interacting with the EU institutions. Furthermore, EK has approximately 80 experts in our Helsinki headquarters who are involved in the EU processes within their own areas of expertise. EK is a member of BusinessEurope, the Confederation of European Business. BusinessEurope is the leading horizontal business organisation at EU level. Participating in BusinessEurope’s activities and preparing business positions are among EK’s most important channels of influence on the EU level. 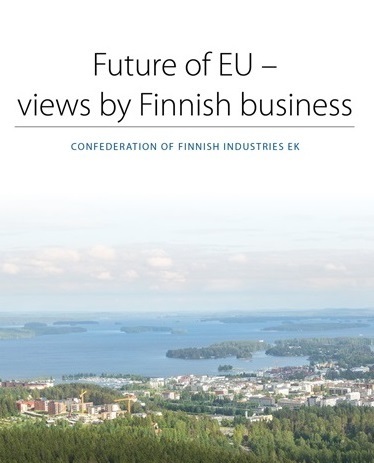 This publication outlines the views of the Finnish business and industry on how to put Europe on the path of growth and prosperity. With this programme EK wishes to make its contribution in seeking a future direction for the European Union.